An estimated two million children in the U.S. are being raised by lesbian, gay, bisexual or transgender (LGBT) parents. While parenting law is supposed to protect the best interests of children, for these families and for the thousands of children awaiting adoption into forever homes, it does not do so. Why? Because the law often denies children the permanency and security of having two legal parents or a forever home—simply because the parents who want to provide that permanency and security are lesbian or gay. An Ally’s Guide to Talking About Adoption by LGBT Parents provides conversation tools that can help build and strengthen support for second-parent adoption and joint adoption by lesbian and gay parents. It also recaps what social science tells us about outcomes for children raised by gay and lesbian parents; underscores that adoption is about creating loving, stable homes for kids; and reaffirms that good parenting is good parenting, no matter whether the parents are gay or straight. Movement Advancement Project, ACLU, Greenberg Quinlan Rosner Research, Family Equality Council, and Human Rights Campaign. June 2012. 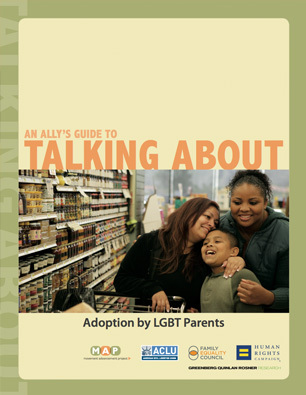 “An Ally's Guide to Talking About Adoption by LGBT Parents.” MAP's Talking About LGBT Issues Series. http://www.lgbtmap.org/allys-guide-talking-about-adoption (date of access).